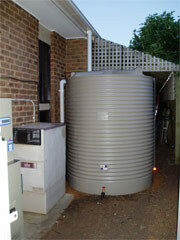 M2 Rain Tank Installations is committed to marketing quality products and delivering the finest workmanship. The team consists of qualified plumbers and electricians, who will ensure that all installations are carried out to the highest standards. Customer satisfaction will be of utmost importance and ongoing service assured. Australia is the driest continent on earth and yet, we are the biggest consumers of water in the world. Melburnians have felt a small pinch of the recent drought. Currently, our water storage levels are at an all-time low. It is up to all of us to help conserve water so that future generations may have the same luxury as we have today. 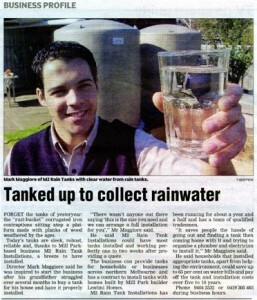 M2 Rain Tank Installations can make this possible. The State Government and bathroom renovation companies are encouraging all of us to save water. There are many products on the market aimed at conserving water, but there is one concept that has been around for hundreds of years and stands out from the rest; rainwater tanks. When it rains, water falls on your roof and runs down your stormwater drain, ending up in the ocean. By installing a rainwater tank, this water can be stored and used throughout the home; in the toilet, laundry, bathroom, garden, and even washing the car. Nowadays with technology, there are all kinds of tank shapes and sizes available; from traditional round styles to water walls and water bladders, which can be used as features in the garden or stored under a decking. 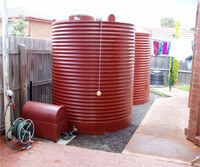 All new five star homes built from the 1st of July will come with the option of a rainwater tank. Rainwater tanks can be installed and connected to your toilets via an automatic device that detects when there is water in the tank, then clicks over and supplies rainwater to the toilets. When the tank runs low, the automatic device detects this and reverts back to mains water. Even in the event of a power failure, the toilets will be supplied by mains water so that you are never without water. here has never been a time when harvesting rainwater could be so simple and affordable. No matter where you live or how much space you have, everyone can easily get a rainwater tank installed today and start saving money and water. 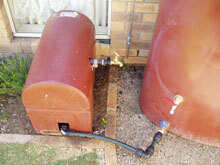 M2 Rain Tank Installations is the solution, as we supply and install all your rainwater harvesting needs. 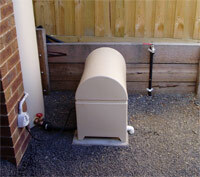 M2 Rain Tank Installations is a supplier of all the leading rainwater tank and pressure pump brands. We have a team of qualified trades people including plumbers, electricians, carpenters, and concreters, to carry out each installation. All our products and services are of the utmost quality and come with warranties to ensure customer satisfaction. Our service also includes free measure and quote. 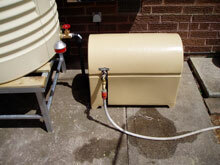 Due to our large range of tanks, pumps and other accessories, we can cater any rainwater harvesting system to all customers needs.